In Brevard County, “development” is often seen as a dirty word. Everywhere we look in our county, we see another shopping center or tract of houses going up and another tree going down. And for the residents that are already here, it’s easy to look at these new developments as the bad guys when it comes to habitat destruction and environmental impact. The problem with that thinking is that “new” is a relative term. When it comes to the environment of Brevard County, it doesn’t matter whether you built your home last week or whether you built it back in 1854 when Brevard was first established. The bottom line is, every home is taking up space that was once wildlife habitat. As homeowners, we have little control over what someone else does with their land. What we do have control over is what we do with our own land. Everyone who owns a piece of property needs to shift their thinking and realize that the term “home ownership” also means “habitat ownership”. We each have the ability to help fix the problem that “new” development is creating. We each have the ability to help restore wildlife habitat by making a few simple changes in our own yards. In 2003, the Project Backyard Brevard website, was created as a means to encourage each citizen of Brevard County to take responsibility for their own piece of the local environment…their own homes and yards. The goal of Project Backyard Brevard is to provide information to all residents, old and new alike, about what they can do as individuals to help protect the wildlife and natural habitat that make Brevard so special and unique. 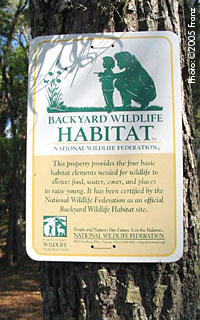 By providing links to information that is already available and working with local experts to create what is still needed, Project Backyard Brevard can help you make the right choices to create a yard that will be a healthy and beautiful habitat for both your family and for local wildlife. Each property owner has the opportunity to preserve, create or maintain a habitat that is beneficial to local wildlife without making major changes to their yards. Project Backyard Brevard can help teach you how. Whether it’s the planting of a tree for local bird nesting, the creation of a butterfly garden, or the choice to leave a small corner of native palmettos for wildlife instead of opting for 100% lawn, each small decision is a step in the right direction for preserving the natural beauty of Brevard County. Will these small changes really help improve the environment? Yes, they will. There are currently over 200,000 homeowners in Brevard County. If each resident planted one native tree, or quit using chemicals so that they could attract birds or butterflies, or even just adjusted their sprinkler heads to quit wasting water, the environment of Brevard County would benefit. The truth is, these small changes usually become larger changes. Once homeowners realize how easy native plants are to grow, or how much money they save with water-wise plants, or how much more enjoyable a yard filled with birds and butterflies is, they quickly become hooked and then eagerly share their new environmental enthusiasm with friends, neighbors and future generations. And although backyard habitats can never restore an inhabited area to its pristine, wilderness state, new studies are beginning to show that they do help to increase the number of bird and animal species that reside in an area. A visit to the Project Backyard Brevard website can help each Brevard County citizen get started in their new role of environmental stewardship. Brevard specific information is provided about gardening for birds, butterflies and other popular wildlife. Links are provided to county, state and national organizations that provide information about creating a healthier home environment. Photos and descriptions of environmentally friendly Brevard yards are available to help inspire and encourage you. For those of you who want a little more “hands-on” help while creating your backyard habitat, a Florida specific edition of The Wildlife Habitat Journal: Restoring and Exploring Wildlife Habitat in Your Own Backyard, is also available from the Project Backyard Brevard website. Part instructional manual, part workbook, part journal, The Wildlife Habitat Journal provides basic steps to help anyone in their efforts to restore wildlife habitat in their own yard and a journal to record their progress. Florida specific plant lists are included for birds, butterflies and hummingbirds and websites and other resources are provided for further research into region specific species. Should we become complacent about attending county commission meetings or writing letters to voice our concerns about the local environment? Definitely not. The future of Brevard County is in all of our hands. But Brevard County begins in our own yards and that’s where we need to start making the changes we want to see. We are all still in the learning stages when it comes to sharing our landscapes with wildlife. Just as huge treeless lawns gained popularity slowly and by example, so will the yards that provide flowers and native plants for wildlife. The Project Backyard Brevard website is the perfect means for you, a friend or a neighbor, to get started. Betsy Franz is a trained Florida Master Gardener and National Wildlife Federation Habitat Steward who uses freelance writing and photography to encourage others to help protect the environment. Franz has been a Brevard County resident for 38 years. She lives in Melbourne with her husband, Tom.